Growth form: Shrublet or small shrub. Flowering. Mar–May. Status: Native. Common. Also recorded: Bahrain, E Saudi Arabia, UAE. Habitat & distribution: Occasional, particularly on more compacted soils on gravelly and rocky areas, and also in disturbed areas near to habitation. 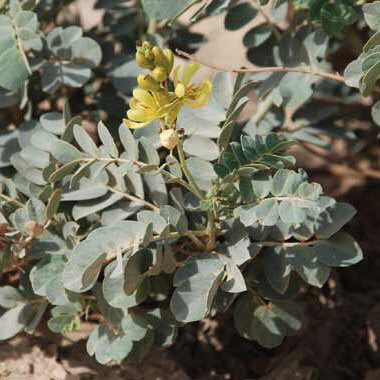 Uses: Grazed by sheep and goats (El Amin), but Mandaville remarks that some bedouin consider it toxic to livestock. It is used as a ‘purgative and stimulant and sold in markets for that use’ (Batanouny), but Mandaville says (of eastern Arabia) that there is ‘apparently no record of such medicinal use’. Ghazanfar also notes that the leaves and seeds are used to treat constipation and stomach cramps.